Four people will win a tote bag of their choice. To enter the giveaway, please pop over to Alphabet Bags and pick your favorite. Leave your comment here sharing which one you love! Please leave a separate comment for each entry. The winners will be drawn on Monday, June 25th and announced shortly after. Good luck! Alphabet Bags is also offering a 20% off discount code for Skunkboy readers! Use the code SKUNKBOY for 20% off everything, now through the 26th of June! 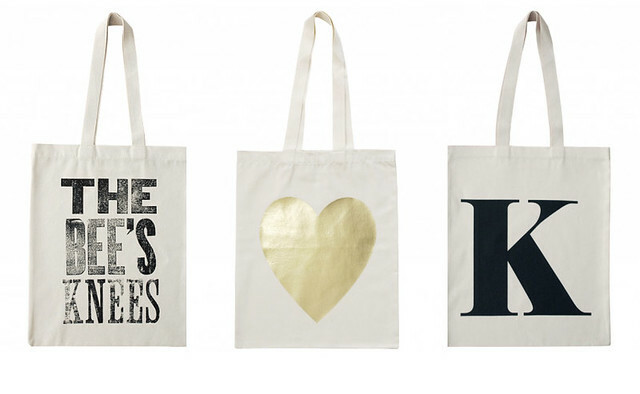 Ooh love these totes! I have to say I would go with the stag bag! Definitely the Coin Purse-& Very cute! I adore these bags! Would totally choose the ampersand natural tote bag! Oh my gosh, they are all so cute that it's hard to pick just one! But I think I would pick the 'Book Worm' tote. Thanks so much for the chance to win! they are all super cute but i think i really love the bee's knees one. i always tell husband i think he's the bee's knees so it would be perfect :) btw - i heart this giveaway!!!! I really like the "You look lovely today" bag! It's so cute! offically a fb page liker! I love everything- especially the initial coin purses. Thanks for the chance to win! I like the coin purse! and also the bees knees bag! so cute! i love the 'you look lovely' and 'hello sunshine' totes. I love the exclamation point bag! It's so simple, quirky and unexpected. Thanks for the giveaway! My favs are the coin purses, and the canvas bag with the black heart! How can I choose just one when they are all so stinkin' cute! I'm obsessing over the adorable "Fish & Chips" tote – especially since it touts all my favorite summer things! BIG into the "You Look Lovely Today" tote too. I love "The Bees Knees" one. I say that all the time and my friends always roll their eyes at me. How wonderful it would be to have a tote with the saying. I'm torn between baby it's cold outside and the stag. followed on twitter cos the totes are so cute! I really liked the silhouetted punctuation mark bags; specifically the ampersand! Also liked them on Facebook. These are great! I'm completely smitten with the tote that says "you look lovely today"
Oh, I love all the heartbags :) specially in black! 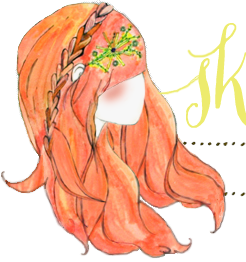 Love ur blog! I love the "Sunshine is delicious" bag! Thanks for the giveaway! I also followed them on Facebook (FB name - Ivy Fuld)! I also followed them on Twitter (Twitter ID - cheerfuld)! I absolutely love that Book Worm tote! Im into the YES bag!!! http://www.alphabetbags.com/shopall/yes.htm. I would pick the red heart bag!! I really like the stag bag! (the one with the silhouette of the deer head). Thank you for such a lovely giveaway. Hello sunshine! :) cute bag! So difficult to pick! But I think I like the good ole' alphabet bag! I love the ampersand in natural-- too cute! As a dedicated shopper, this one should be my motto! stuck between the gold heart on black and the one that says "life's a beach!" my fave is the Oh What a Beautiful Day! these are positively AMAZING! ahhh! i love them. funny that you featured a K because that's my first name initial. obsessed with the seaside natural bag! i have liked them on facebook as well. It's hard to choose a favorite but I'm really digging the You Look Lovely Today tote! i love the bee's knees and je t'aime! I love the Hello Sunshine bag! I also like the initial coin purse...so adorable! I really like their bags. I like the stag one. Or any or all with animals on them! I like the black heart or c natural totes! I think I like the golden heart the best -- very nice! Hard to pick because they have so many cute designs! I'd have to go with the gold heart on the black tote. One can never have too many tote bags! I like the gold heart on the black bag. I love the J Leopard Pouch - so cute! And following on Twitter. Thanks! I like the "Good As Gold" bag! I love the tan bag with the red heart! Fingers super duper crossed! Liked Alphabet on facebook. I LOVE the Bee's Knees bag. I love the pink heart tote! Soooo amazing! LOVE the 'sunshine is delicious' bag. How cute is that!?! LOVE that ampersand coin purse! All of them are adorable! I love all of the tote bags, my favourite is 'Here Comes The Sun'. WHat a ton of cuteness. Love the coin purses, but the gold heart tote is the best. I would only be swayed from its allure by the presence of an interrobang tote. PLEASE CREATE AN INTERROBANG! I adore The Bees Knees bag! Definitely the Stay Gold bag! I'd give it to my best friend of 30 years. We read The Outsiders over and over in the 80s and watched the movie at least 20 times. I just bought the DVD for her and watched it last weekend. We also recited the Robert Frost poem in front of our 6th grade class. We still end all letters to each other with "stay gold"
I love the ' you look lovely today' bag! I love those bags - my favorites are the Gold "A" Lettered one and the Sunshine is Delicious bag! love love love the black and the gold heart bag! I love the bag that says the Cat's Pajamas! I can keep all the cat toys in it! LOVE the Ampersand bag in black - simple, yet stunning! I really like the alphabet bag, why choose one letter when you can have the whole alphabet! (: I also like the bee's knees bag because let us face it, it truly is the bee's knees. Thanks for the cute giveaway. Love!! I have many favorites, but I think I like the SUN one best. So perfect for summer! I really love the heart tote bags so adorable. I liked Alphabet Bags on Facebook! I love the " sun sea sand " tote! I love the "joy" bag. One of my goals this summer is to learn how to live in the moment and enjoy the little things. That bag would be a great reminder! I love the Heart - Red-tote. It's really cute! I adore the black heart tote! I like the gold "A" bag and the "you look lovely today" bag. My favorite is the Heart-Red bag! I liked Alphabet Bags on Facebook. I love love love the coin purses & of course I would have to pick the "Z"
I love the gold heart tote, all of the bags are really cute though! I'm a beekeeper so I'd have to get The Bees Knees bag! These bags are cute, though, I could easily have picked several other favorites! & liked them on FB. THANK YOU! Saa-wheat! It is a toss up between the Seaside bag and the mini E.
And, I like them on fb! I love the one with the metallic gold heart, its so cute! I LOVE the coin purse with the pound sign, its just so cute, even if I'm not European! I love the 'hello sunshine' one, a little sunshine in my life is always needed! The Hello Sunshine is perfect for the summer! I would very much like the V - Mini bag!!! I need a new lunch bag to go to work! Love "The Bees Knees"! Super adorable! Definitely the 'I'd rather be at the beach' one... which is where I'd rather be right now! Is so hard to pick just one! :) I seriously love the heart totes! I love the gold heart on black tote, CLASSIC. Oh goodness, I think I've found my new bag. Haha! As a bride, my favourite is the "Bride to Be" one..and then the "Bridesmaid" ones for my bridesmaids! aaaaaaaaand I just liked them on Facebook. Oh my goodness!! They are all so cute!! I think I like the Cat's Pyjamas the best!! Too cute!! i love love LOVE the heart-gold bag! so cute! Oh gosh, how would I choose??? I love the "HOLD ME" tote. Hilarious! But the gold heart is so cute too! Cute! This would be a great bag for the farmers market. Thank you for this lovely giveaway. I would loose the "I" in gold, for my name! I love the Hello Sunshine bag!! Absolutely delicious. My favourite bag is the "K - Black"....it's so pretty and goes with my name! These are all so cute! I have to say, the alphabet bag is my favorite, though.